A graduate of the Faculty of Production Engineering and the College of Social Sciences and Administration at the Warsaw University of Technology as well as post-graduate studies in macroeconomic analysis at the Warsaw School of Economics (SGH). A collaborator at the Centre for Antitrust and Regulatory Studies (CARS) of the University of Warsaw. A member of the National Centre for Research and Development (NCBR). A representative of the Polish government on the Board of the International Organization of Space Communications "Intersputnik". In March 2016, he took the position of Director of the Analysis Bureau at the Ministry of Digital Affairs. He coordinated the implementation of the Strategy for Responsible Development in the area of digital affairs and the development of a concept of an electronic ID card. He also cooperated with the Council for Digitization and start-ups, with responsibility in the field of innovation. He was appointed as President of the Office of Electronic Communications by the Sejm of the Republic of Poland on 14 September 2016, with the consent of the Senate given on 22 September 2016. In his private life: an enthusiast of water motorsports, a diver, a Water Volunteer Rescue Service (WOPR) lifeguard and a member of the Warsaw Masters Team. A graduate of the University of Technology and Agriculture in Bydgoszcz in 2000, holder of an MSc Eng degree in electronics and telecommunications. From 2000, an employee of the Ministry of Communications. A co-author of the "ePoland Strategy for the Development of Information Society" programme adopted in 2001. 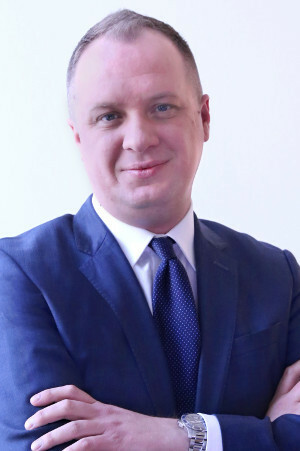 A former member of the team responsible for the strategy of ICT development in Poland. From 2001 to 2006, he worked for URT, URTiP, and then for UKE. In 2006, appointed as Deputy President of UKE with responsibility for telecommunications and postal issues. 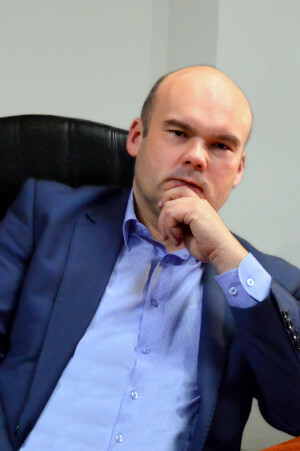 One of the architects of a demonopolisation process of the broadband market in Poland. A co-founder of a regulatory agreement between the incumbent and UKE. He created regulatory policy for interconnection rates in the fixed and mobile markets and developed the concept of interconnection settlements in the mobile market as well as reference offers for operators with significant market power. In 2012, appointed as President of the Office of Railway Transport (UTK). Under his leadership the UTK was granted an Emblem and Quality Mark of a "Friendly Office". In the same year, the UTK website received the first prize for the most accessible website to people with disabilities and at risk of digital exclusion in a competition "Website without barriers". From 2015 to 2016, Vice-chair and then Chair of the Independent Regulators' Group - Rail (IRG-Rail). On 25 February 2016, appointed as Deputy President of the Office of Electronic Communications by the Minister of Digital Affairs. A graduate of the Maria Curie-Skłodowska University in Lublin, holder of a master's degree in law from the Faculty of Law and Administration. From 2000 to 2003 he worked for the Ministry of Communications and was in charge of proceedings for granting licences to courier companies. From 2003 an employee of URTiP, then UKE, for most of the time Director of the Postal Market Department. From 2014 to 2016 Deputy President of UKE for the postal market. A co-author of the Postal Law Act and implementing acts based on this act and other acts related to the postal market. He was involved in developing regulatory tools, such as the financing mechanism for postal services, regulatory accounting and cost calculation as well as the monitoring system for the quality of service. He contributed to the development of the Third Postal Services Directive and to the establishment of the European Regulators Group for Postal Services. He represented the President of UKE internationally in the Postal Directive Committee of the European Commission, the Administrative Council of the Universal Postal Union (UPU), plenary meetings of the European Regulators Group for Postal Services (ERGP) and the European Committee for Postal Regulation (CERP). He was twice a delegate to the UPU Congress, for the last time in 2016 as the deputy head of the delegation of Poland who was then elected a member of the Council of Administration and the Postal Operations Council. On 15 February 2017, he was appointed as Deputy President of the Office of Electronic Communications for the postal market by the Minister of Digital Affairs. In his private life he is interested in the automotive industry and international policy. A graduate of the John Paul II Catholic University of Lublin, holder of a doctorate in law. 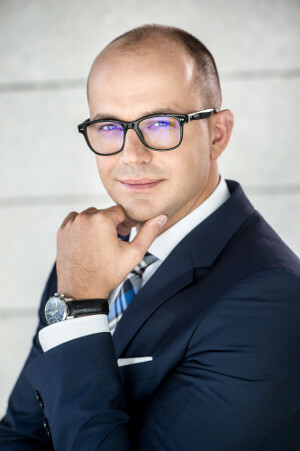 He completed post-graduate studies in marketing and management at the Pultusk School of Humanities, in organisation and management at the Military University of Technology, in public administration inspection, control and audit at the University of Warsaw and an MBA programme at the Lazarski University in Warsaw. From 1998 to 2000, he worked for the Central Management of Poczta Polska. From 2001 an employee of URT, URTiP and then UKE. In 2006, he was appointed as Director General of the Office of Electronic Communications. From 2014 to 2016, a member of the Scientific Council of the National Institute of Telecommunications. An active academic lecturer, author of more than seventy publications, among others on cybersecurity as well as on penal and administrative liability in telecommunications and postal activities.